Friday night, Kobe Bryant of the Lakers suffered a left Achilles tear. On Saturday he underwent surgery to repair the tendon. Now everyone is asking if and when he will be back. The Achilles tendon is the longest tendon in the human body. It is made up of two muscles: the gastrocnemius muscle and the soleus muscle. The muscular unit of the tendon attaches from the back of the knee to the heel bone. About 2/3 of the way down the leg, the muscle bellys transition to the Achilles tendon. The Achilles tendon is prone to injury in the area known as the watershed area. This area goes from 2-6 centimeters up from the attachment site of the Achilles tendon to the heel bone. In the watershed area, the blood supply to the tendon is poor. This is an area where the tendon has a poor ability to heal itself. 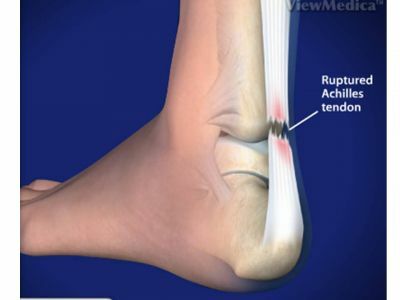 Most Achilles tendon tears occur in this area. The Achilles tendon functions to bring the ankle downward, similar to the motion of press on the gas pedal. With jumping activities, the Achilles tendon sees forces 8 times that of one’s body weight. With sprinting activities, that force increases to 12 times that of one’s body weight. Achilles tendon tears or ruptures are commonly seen in weekend warriors and those who participate in sports with a lot of push-off actions. Some patients who have been on an antibiotic from the fluoroquinolone family may be at risk of tearing the Achilles tendon. Patients will report a sudden pop in the back of the ankle and a rush of blood. Some will say they feel like someone has kicked them in the back of the ankle. They will notice a loss of strength in the foot when trying to stand on the ball of the feet. Pain, swelling, and bruising are common. When carefully touching the Achilles tendon in the watershed area, a gap may be felt in the tendon. Achilles tendon tears can not be seen on xray. Very rarely is an MRI or ultrasound needed to make the diagnosis. The diagnosis is usually made with physical exam findings alone. WHEN TO SEEK MEDICAL CARE If you are concerned about an Achilles tendon tear, you should see a medical professional within hours or days of the injury. 2. A percutaneous technique where needles are placed through the skin and Achilles tendon. The tendon ends are never seen, so it is difficult to be sure that they are toughing when the tendon ends are sutured together. Nonsurgical patients have an 18-20% chance of re-tearing the Achilles and lose some push-off power. This is a concern for elite athletes. Surgically treated patients have approximately a 2% chance of re-tearing the tendon and have a more normal push off in the injured ankle. Earlier this year, a study showed that NBA players who returned to play after repair of complete Achilles tendon rupture showed a significant decrease in playing time and performance. A total of 38.9% of players never returned to play. Based on these studies, Kobe has a nearly 40% chance to never return to the NBA. Furthermore, if he returns, the shortest time frame I would expect him to play is 7-9 months. During his first season of play back, he is likely to have fewer minutes played per game. However, having said this, athletes have returned to play in remarkable fashion.